I telephoned Barry on Thursday afternoon,he brought my selected machine to my house the next day,showed me how to use it and VOILA I am now the very excited owner of a Janome Sewing machine! 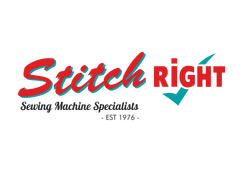 I purchased a Janome 6600P for my business as a professional curtain maker from Barry at Stitch Right Sewing Machines in 2010. Ever since Barry has looked after my machine to ensure it's continued smooth operation. I have been extremely happy with the prompt friendly response and the after sales care and service Stitch Right have provided. Sharon Kearney, Grasshoppers Interiors,Hampshire. We can provide a full demonstration of any sewing machine old or new. You can come to our showroom or - make use of our in-home demonstration. With our experience and assistance you can make an informed decision on choosing the sewing machine that is right for your needs. Not only do we give you free advice, but we also have a try before you buy scheme. Fully stocked mobile repair vehicle with an extensive range of parts and accessories. All images used for preview are copyrighted by their respective owners.